The American Hereford Association and Certified Hereford Beef work every day to be great examples of American Excellence Built by Tradition. 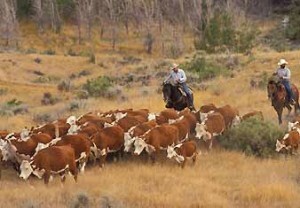 Cattle ranchers around the world have long known that great tasting beef comes from great cattle. Along with great chefs, they reckoned you had to start out with the best stock to get the best steak. And it turns out they were right. In the 1700s, folks around Herefordshire, England discovered that these red bodied, white-faced cattle produced some pretty spectacular beef. Later, in the 19th century, some progressive American farmers began importing these majestic Herefords to grow in the western frontier and established the oldest breed association in 1881, The American Hereford Association. Sure enough, the rest of America fell in love with these wholesome cattle and by the 1960s, Hereford beef was the steak du jour on every grill in America. 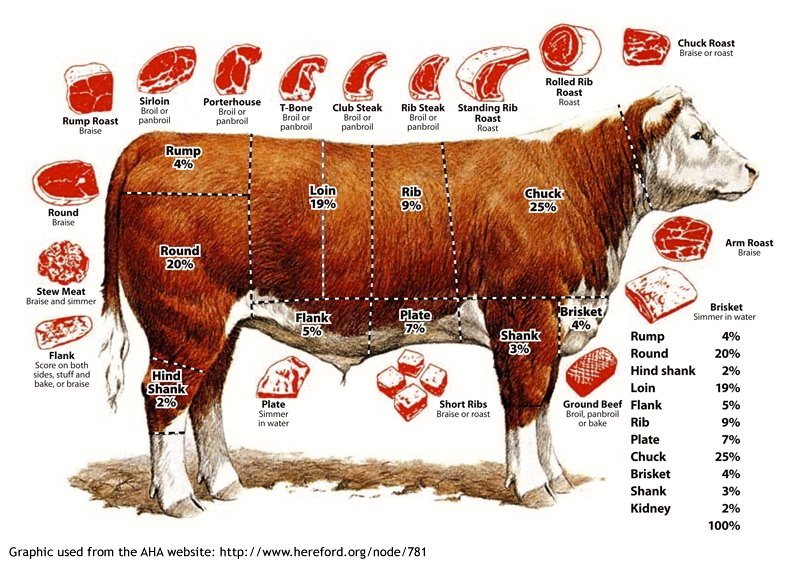 In 1991, the American Hereford Association, its 5000 family ranches, guardian of the Hereford breed since1881, undertook history’s most comprehensive cattle breed study to determine Hereford’s place in the beef supply. The Colorado State University studies were simple. They found that Hereford beef’s merits in the minds and mouths of the ultimate quality judge – you, the consumer, were superior in every category. In 1995, the American Hereford Association established the Certified Hereford Beef® program to usher in a new era of great taste, nutrition and to truly build upon its Excellence, built by tradition. Ranchers depend on healthy, natural resources for their livelihood and therefore place high values on the stewardship of the land. Many of our growers are third and fourth generation Hereford Beef producers who understand the importance of sustainable agriculture for the generations that follow. At Certified Hereford Beef®, we support the wise use of the modern capabilities of our food system. Our growers recognize that without it, our nation is woefully unequipped to feed the world safe, healthy beef and conserve the earth’s natural resources. Heat oven to 350°F. Spread mustard evenly over all surfaces of beef roast. Press 1 cup crouton crumbs evenly onto roast over mustard. Place roast, fat side up, on rack in shallow roasting pan. Insert ovenproof meat thermometer so tip is centered in thickest part of beef, not resting in fat. Do not add water or cover. 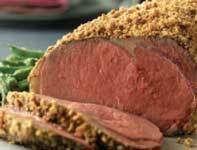 Roast in 350°F oven 1-3/4 to 2 hours for medium rare; 2 to 2-1/2 hours for medium doneness. Meanwhile toss green beans with oil on metal baking sheet. Add remaining 1/4 cup crouton crumbs; toss to coat. Roast in 350°F oven with beef roast 30 minutes. Remove roast when meat thermometer registers 135°F for medium rare; 150°F for medium. Increase oven temperature to 450°F; continue roasting green beans 10 to 20 minutes or until tender and starting to brown. Transfer roast to carving board; tent loosely with aluminum foil. Let stand 15 to 20 minutes. (Temperature will continue to rise about 10°F to reach 145°F for medium rare; 160°F for medium.) Carve roast into slices. Season beef and green beans with salt and pepper, as desired.